Plans are to run a 36mm Delorto Pumper carb I believe. I have a brand new 34mm Mikuni too, but am partial to Del LOrtos. I have one on a Panhead, one on a 45 and one on a Super 10. They all work good. But because they are designed for side valve engines, a big advantage is the possibility of much steeper acceleration and deceleration ramps than OHV/OHC. Which give more full valve open degrees at the top since it spends less degrees to open and close. I think a few comments on valve lift rates are in order. In the plot above (on page 1 of this thread), the closing side of both intake and exhaust lobes are perfectly overlaid which shows that the KHK and KR lobes have the same lift rate (if the slope of the line is the same the lift rate is the same). So whether you employ the KR or KHK cam the lift rate is the same and the valve train is subject to the same forces, thus one cam is no harsher than the other on the valve train. In the plot below, the KHK and KR intake lift curves have been shifted in order to align the opening sides for comparison of lift rate. As above, the opening lift rates for these 2 cams are essentially identical. Also shown in the plot is an intake valve lift curve for a late model Honda CRF450 which is an OHV OHC 450 single cylinder. The lift rate of the CRF 450 is essentially identical to that of the KHK and KR lobes and such engines are routinely and reliably operated to 10,000+ rpm with no issues. 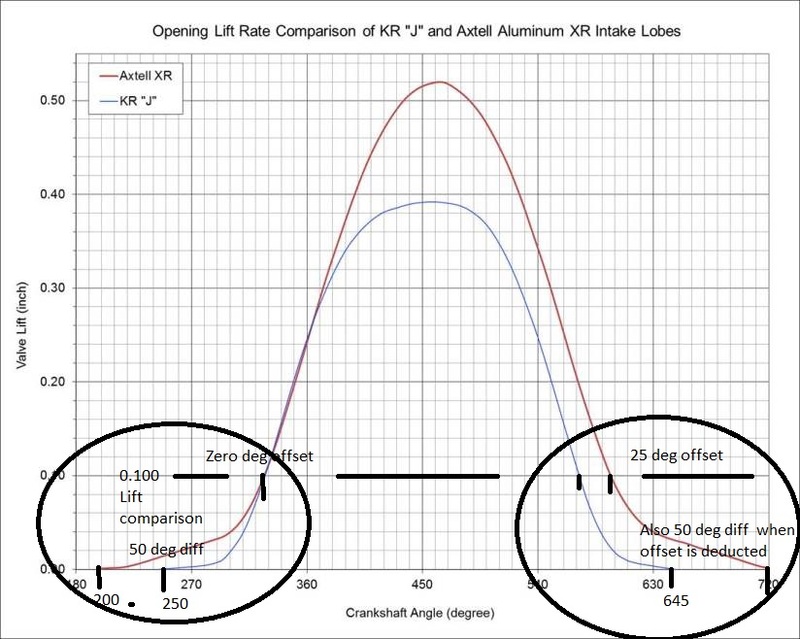 In summary, the KHK and KR lobes have the same lift rates, and the lift rate is certainly on the aggressive end of the lift rate spectrum. However, such lift rates are not out of the ordinary on modern performance OHV OHC valve trains where they run reliably at high speeds and do not result in instantaneous self-destruction of the subject engine. Last edited by wz507 on Sun Jan 13, 2019 1:18 pm, edited 1 time in total. How did you plot the Honda cam? At the cam or at the valve? thefrenchowl wrote: How did you plot the Honda cam? Just as the plot axis is labeled - "valve lift". The subject valve train is a bucket style and about 10 years old. More recently several of the manufacturers (Honda included) have moved away from the bucket and gone to a finger follower to reduce valve train mass further (buckets are heavy). Below is an image of the new 2019 Kawasaki KX450F valve train with finger followers. The stock KX450F cam is also interesting as it has only 228 deg duration at 0.050" lift yet the engine output is 2 HP/cu in (~ 55 HP). Just goes to show that when airflow is good the valve doesn't need to be open for very long to make decent power. As long as we’re comparing lift rates of various valve trains thought some of you might enjoy seeing the transition in valve motion that occurred from our beloved late KR to the oval port XR. Actually, yours charts confirm my statements!!! On the opening side, it takes the XR cam 50 crank degrees more than the KR cam to get 100 thou of lift, which means you cannot initially accelerate push rod and rocker as fast as the KR can accelerate its valve to 100 thou. On the closing side, if we move the XR curve along the KR curve where its 100 thou left to close point is, the XR cam has to slow down at a slower rate than the KR valve and it looses another 50 degrees. So 100 degrees of XR cam just trying to accelerate/decelerate it to the KR point without as I said, rocker or push rod bending past their own resilience. Over 100 thou, yes, the acceleration/deceleration ramps stop and the rise is then proportional only to rotation of cam. So indeed, the KR type cam is the wildest thing around as far as ramps are concerned. The Axtell XR750 cams were developed for the Axtell version of the round port XR750 heads with the Axtell exhaust, intake manifolds, and carbs. Mutt wrote: So Dave, how are the E or F cams working out for ya? It's a 54 KH motor, but it was tweaked - E or F cams, KR #7 heads, KR valves, KR double-valve spring setup. When I got it, it had a magneto, straight pipes and a 20 tooth trans and 51 tooth rear wheel sprocket. Very streetable, very perky. Good acceleration, not quite as strong as my 62 XLCH, but no slouch either. The straight pipes were really loud. The previous owner said it had sounded "constipated" with the stock exhaust system. Engine completely rebuilt. Fixed a crack from one valve seat down into the cylinder - but above the ring lands (using lock and stitch). Replaced valves, no margin left. Stainless KR valves from Enfield Racing. Replaced the double valve springs - RD Valve Spring #1005 (Thanks, Dennis Schoenfeldt). Used stock timer instead of mag. Set timing at KHK setting (mark at rear of inspection hole, ~31-degrees) Stock exhaust system. Went to 21 on the trans sprocket (stock) and 49 on the rear wheel sprocket (stock). I just got it running a week ago on a rare 60-degree day, and its maiden voyage was 32 miles. The next day it dropped down to 40-degrees, and then we had snow. Tonight down to 13. Good acceleration, good steady cruising, idles fine. Stock exhaust sounds nice, does NOT sound constipated. Listening to the bike, I can't tell that it has big cams. No poor idle, no loping, no "coming on" at a certain RPM - it just runs strong in all ranges. I can't wait for the weather to warm up so I can be riding again. Only change I'm gonna make is to advance the timing a degree or two and see if it makes any difference. I run the standard KHK cams in my 55"....They work very well. Less fatigue on valve components, easier to set up proper spring travel, and kept below 5000rpms. They have good torque - and make my KHK run great in all around conditions. When in doubt, I usually go with a cam grind with less overlap, slighter higher lift than stock with not a lot of duration - helps the torque (bottom end).